Sailors have chosen esteemed figures, from master chiefs and admirals to astronauts and pro football players, to reenlist them. That circle now includes an Elvis impersonator. 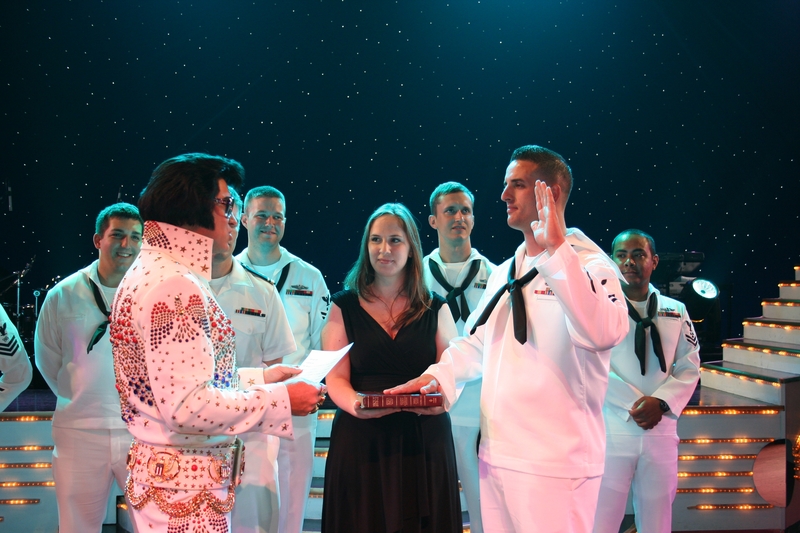 Electronics Technician 1st Class (SS) George Melton, a 26-year-old and self-described Elvis fan, was enlisted Sept. 1 by an Elvis look-a-like at Foxwoods Resort Casino in Connecticut, in what may be the fleet’s first re-enlistment by an Elvis impersonator. Melton, who bears an Elvis tattoo on his left forearm, recited the oath of office read by Elvis impersonator Bill Cherry and reupped for four years while his shipmates looked on. Melton said Elvis was the perfect choice. OK, so who is your ideal re-enlistment officer?